I’m totally in love with my new LaCie Rugged Safe 1TB drive. 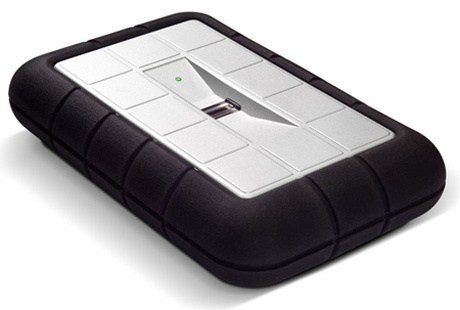 It’s a rugged external drive, Firewire 800 / USB 2, which is encrypted using your fingerprint. Sounds fancy, right? It kinda is – and it works wonders. The AES 128-bit encryption is plenty for me. I’m not storing secrets on it, but I’m using it to store mostly my Aperture 3 masters (RAW files) which I wouldn’t want some stranger to browse around in, or steal, if my drive should ever be stolen. If you’ve never had a computer or hard drive stolen you’ll probably think this sounds nuts, but I have tried that – both, actually – and now I have peace of mind that if/when it happens again, my data continues to be mine. Anyway. The problem with the LaCie Rugged Safe drive is that you need the software “LaCie Safe Manager” to setup the drive to store fingerprints and LaCie only has a 32 bit version out, which doesn’t run on Mac OS X Lion (and perhaps Snow Leopard as well?) if you’re running a 64 bit kernel. 2) Boot Mac OS X in 32 bit kernel mode, install LaCie Safe Manager, setup your drive (register fingerprints) – then reboot back into 64 bit mode and that’s it. Click here to learn from Apple how to boot in 32 bit mode. Once the drive is setup, you really don’t need LaCie Safe Manager anymore – and if you do, just go back into 32 bit mode. All you need to unlock your LaCie Safe drive, is a registered fingerprint, which I’m guessing is one of your own fingers. No additional software requires installing, which I think is pretty neat. The drive is somewhat expensive for a mobile 1TB external drive, but the encryption and fingerprint unlocking/locking works great – I think it only missed my finger once or twice, because I swiped too fast. This also uses hardware encryption, so no need for a software-based encryption which also takes up your computer’s CPU resources. Plus, I’ve had great experiences with LaCie external mobile drives these past 5 years, never had a problem. Highly recommended! You can register up to 10 fingerprints, so you can register one from each hand, and maybe the one of your wife or something. Otherwise it’s of course also possible to unlock the drive using a secure password and the software. But for everyday use, and without installing any software, fingerprints are fast and easy. And it works like 95% of the time, if not more. When it doesn’t work, you swipe again a little slower. Klaus recently posted… Can the Federal Government Save Some Money by Switching to the Cloud? Comment puis-je faire réinitialiser ou du moins pouvoir ajouter un autre utilisateur, étant donné que j’ai égaré (oublié) mon mot de passe, je déverrouille le disque à partir de mon empreinte uniquement ? I think you have to reset it some how, and all your data will be gone. Try to look in the manual or on LaCie’s website, or contact LaCie support to ask for assistance, as I can’t remember exactly how it is done (never did it, but I think I remember reading about it when I first got the drive a long time ago). Klaus recently posted… Apple to end up like Sony? Next post: Can the Federal Government Save Some Money by Switching to the Cloud?